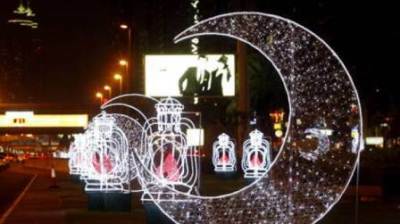 Ebrahim Al Jarwan, General Supervisor at Sharjah Planetarium, said that according to astronomical calculations, Friday June 15 will be the first day of Eid Al Fitr and looking further down the calendar, Eid Al Adha will most likely fall on Wednesday, August 22. The Islamic calendar is based on the moon and, according to astronomical calculations, Ramadan this year will last for 29 days. In this archive photograph, an official from the State Islamic University (STAIN), uses a telescope to observe the moon after sunset from the coast of Madura in East Java province of Indonesia on the eve of Ramadan. Source: AFP. Every year, Muslims across the world gather with friends, family and the entire community to celebrate Eid as the month-long fasting of Ramadan ends. The exact dates of the start and the end of Islam's holy month of Ramadan, however, depend on the sighting of the new moon.